Before looking at the example, first let see about DOM and Shadow Dom. DOM - It is a programming interface that treats an HTML, XHTML, or XML document as a tree structure wherein each node is an object representing a part of the document. We will look an example using Chrome's download page. If you observe the below image, to get the header text (h1 tag), we need to navigate to 3 nested shadow root elements. In order to do this, first we will try to get the WebElement of the Shadow-root using below method. The below commend will return a web element after executing executeScript() function. Now using this root WebElement, we will try to find the next root element and proceed until we reach the final Shadow Root element. So here in our example, we will navigate till shadow root 3 to access header tag h1. Chrome Browser has native support for ShadowDom from Chrome Version v49. So chrome browser renders Shadow DOM when the application is built with Polymer webcomponent. 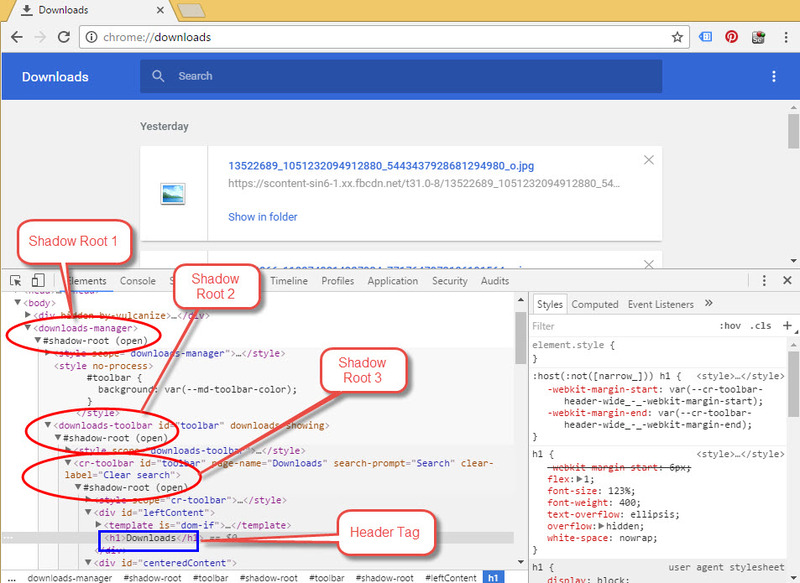 Below image shows the browsers which has native support for Shadow DOM and that are in development. Firefox Shadow DOM is not supported by default (until now with Firefox v52), but that can be enabled. To Enable Web Components in Firefox, type about:config in the address bar to navigate to config page and dismiss any warning that appears. Then search for the preference called dom.webcomponents.enabled, and set it to true. Be cautious before making any changes to config. Let me try to execute below test in Firefox browser (Executed in Firefox v49.0.1) on a website which was developed with Polymer Webcomponent and has Shadow DOM elements. But if executed in chrome, it throws NoSuchEelementException, as chrome browser has native support of Shadow DOM by default. 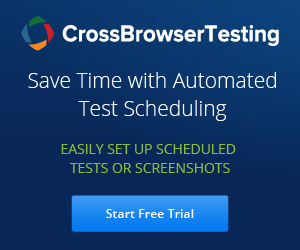 Try to execute the above test in both Firefox and Chrome browser to see the difference. Thank you for writing this article. I was looking for a better way to validate downloads. Whenever the server had a hiccup my tests would fail because a download was taking too long. Now I can verify that a new download item was added to the chrome download page before I move on to the next test. Thanks again. In application under canvas there are various operation like click on button, Sendkeys, dropdown for which there is no attribute for these webelement,I am hunting how to automate these scenario. Thanks for posting i have one doubt where exactly you are declaring arguments when i tried your code i am getting error.